Infection of humans with naturally occurring strains of rabies virus leads to fatal diseases. This and other factors make this virus difficult and dangerous to work with — indeed, much of the work on it is carried out in a few very isolated laboratories in the United States, including Plum Island in Long Island Sound. By contrast, the closely related rhabdovirus vesicular stomatitis virus (VSV) is one of the most carefully studied extant viruses. Its replication strategy forms a valid model for the replication of all Mononegavirales viruses and provides important insights for the study of replication of other viruses with negative-sense RNA genomes. Remember that negative-sense viruses must have some way to turn the viral genome (virion RNA) into mRNA before infection can proceed. The VSV virion and genetic map are shown in Fig.15.1. Like most rhabdoviruses, it has a distinctive bullet-shaped structure. The VSV genome encodes five proteins, all present in the virion in different amounts. The viral genome is about 11,000 bases long. Since individual mRNAs are generated from the virion negative-sense RNA, viral genes in the genome have an order opposite to the order in which mRNAs appear in the cell. Locations of the viral genes are shown in the genetic map of Fig.15.1. The L and P proteins function together to cap mRNA, generate mRNA, polyadenylate positive-sense viral mRNA, and replicate the viral genome. (Remember, the virus must bring its own replication enzymes into the cell because the cell cannot deal with single-stranded RNA that is not like mRNA.). Fig. 15.1 The vesicular stomatitis virus (VSV) virion. All rhabdoviruses have this characteristic bullet shape that appears to be due to the P (formally called NS) and L proteins interacting with the envelope in a specific way. The 70 X 180-nm VSV virion contains enzymes for RNA transcription that can be activated by mild detergent treatment and incubation with nucleoside triphosphates in vitro. The genetic map of VSV is also shown. The 11,000-nucleotide (nt) virion negative-sense strand RNA encodes five individual mRNAs; each is capped and polyadenylated by virion enzymes. Note, because the genomic RNA serves as a template for mRNA synthesis, it is shown in 3' to 5' orientation instead of the conventional 5' to 3' orientation. G = envelope glycoprotein; L = part of the replication enzyme; M = matrix; N = nucleocapsid; P (or NS) = also part of the replication enzyme. The first part of the VSV replication cycle is outlined in Fig. 15.2. Virus attachment and internalization occur by receptor-mediated endocytosis. The virion does not fully disassemble in the infected cell. The intact ribonucleoprotein (RNP) nucleocapsid contains the genomic negative-sense template and transcription/replication enzymes. The virion-associated transcrip-tion/RNA replication enzyme initiates and caps each of the five discrete positive-sense mRNAs within this transcription complex. Like the positive-sense RNA viruses expressing capped mRNA, this capping takes place in the cytoplasm. Interestingly, while the cap structure is identical to that found on cellular mRNA, the specific phosphodiester bond cleaved in the cap nucleoside triphosphate is different from that cleaved in the nucleus by cellular enzymes. This difference suggests that this enzymatic activity was probably not simply "borrowed" by the virus from an existing cellular capping enzyme, but was derived from some other enzymatic activity of the cell. Fig. 15.2 The VSV replication cycle. 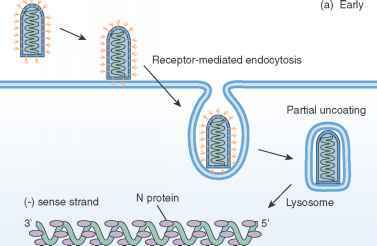 (a) Early events in infection begin with virus attachment to the receptor followed by receptor-mediated endocytosis and partial uncoating to virion ribonucleoprotein (RNP). This is transcribed into mRNAs that are translated in the cytoplasm. (b) Later, as protein synthesis proceeds, levels of the N (nucleocapsid) protein increase, and some nascent positivesense strand from RI-1 associates with it. This association with N protein blocks the polyadenylation and cleavage of individual mRNAs, and the growing positive-sense strand becomes a full-length positive-sense strand complement to the viral genome that serves as a template for negative-sense RNA synthesis via RI-2. (c) At still later times in the replication cycle, viral proteins associate with the nucleocapsids made up of newly synthesized negative-sense genomic RNA and N protein. 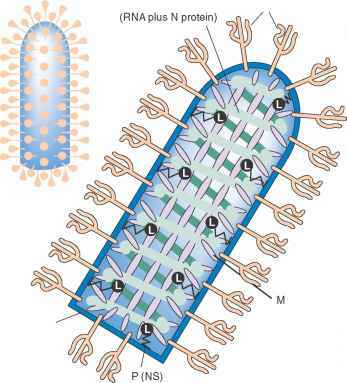 These migrate to the surface of the infected cell membrane, which has been modified by the insertion of viral G protein translated on membrane-bound polyribosomes. 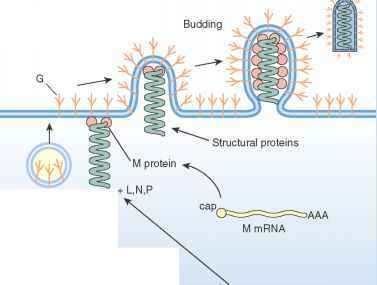 M protein aids the association of the nucleocapsid with the surface envelope and virions form by budding from the infected cell surface. New nucleocapsid long polyA tail and releases mRNA. 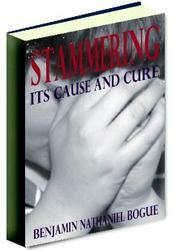 The enzyme can then release, start over, or continue on. The process is outlined in Fig. 15.2; this biochemical "decision" has resulted in a polarity of abundance of viral mRNA and the proteins encoded: nucleocapsid (N) protein > P (NS) protein > matrix (M) protein > envelope glycoprotein (G) > L protein. Negative-sense virion RNA can only be generated from a full-length positive-sense template in an RI-2 complex. But the partially disrupted virion generates mRNA-sized pieces of positivesense strand. As shown in Fig. 15.3, full-length negative-sense strand is only generated when levels of N protein become high enough in the cell so that newly synthesized positive-sense RNA can associate with it. This association prevents the rocking—polyadenylation—cleavage— reinitiation process used in the generation of mRNA and allows the formation of full-length template. This genome-length positive-sense template serves as template for new virion negative-sense strand, which also associates with N, and the other structural proteins encoded by the virus. While the process and biochemical "choice" between production of mRNA and full-length positive-sense template RNA are best characterized in the replication of VSV, it appears that very similar mechanisms exist for other viruses in the Mononegavirales order. Further, other negative-sense viruses that have multipartite genomes probably utilize equivalent mechanisms since (where characterized) their positive-sense genome templates are larger than the positivesense mRNA expressed during infection. Fig. 15.3 A higher-resolution schematic of the generation of positive-sense strand mRNA from genomic negative-sense strand RNA template in the presence of low levels of N protein. Polymerase associates with the template at the extreme 3' end, and "tunnels" or "burrows" under the N protein. 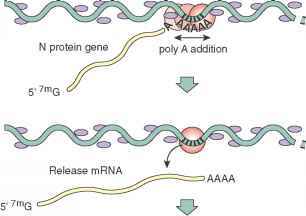 Transcription begins with capping of the nascent mRNA, and proceeds through the first gene on the template (the N protein) gene. 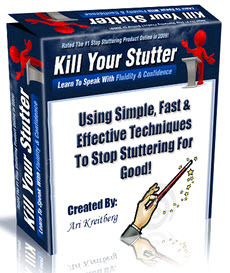 At the end of this gene, the transcriptase encounters an intergenic "pause" or stutter site. The enzyme pauses here and adds a number of A residues to the nascent mRNA, which is then released. The transcriptase then either dissociates from the template and begins the process over again at the extreme 3' end, or continues on to synthesize a transcript encoding the next gene on the genomic template. At the end of this gene, the same process occurs. Since the transcriptase has a higher probability of returning to the extreme 3' end of the template, the mRNAs are synthesized in decreasing amounts, with those encoding N protein > P (NS) protein > M protein > G protein > L protein. 5' 7mG (s^ P(NS) protein gene of mRNA synthesis, template synthesis, and new negative-sense genome formation continues for an extended period until sufficient levels of the viral structural proteins are attained to form the virion RNPs. Virion RNP then buds through the plasma membrane and is released. These late events are outlined in Fig. 15.3. As noted, many virus infections are characterized by virus-mediated inhibition of host mRNA and protein synthesis. The mechanism of this shutoff varies with the virus in question. For example, poliovirus, which does not utilize a capped mRNA, actually inhibits the ability of capped mRNA to be translated by modification of a translation initiation factor following infection. Obviously, this mechanism cannot work with viruses that express capped mRNA. M protein. In this role, the protein specifically interferes with the transport of proteins into and out of the nucleus by inhibiting the nuclear transport proteins of the cell (see Chapter 13). Since some negative-sense RNA viruses, such as bornaviruses and flu viruses, utilize the nucleus for replication, this mechanism cannot be universal for negative-sense RNA viruses. The disease caused by VSV involves formation of characteristic lesions in the mouth of many vertebrates (hence the name, vesicular stomatitis). Although humans can be infected by VSV, this virus is primarily a disease of cattle, horses, and pigs. Such a wide host range seems to be a common feature of rhabdovirus infection. VSV-induced disease can be severe in animals because they cannot eat during the acute phase of infection. The course is generally self-limiting and mortality rates are not significant, provided proper care is given to the affected animal. Such is obviously not possible with free-ranging cattle, and VSV outbreaks can have severe economic consequences if not properly managed. The disease caused by the related rabies virus demonstrates a completely different strategy for virus pathogenesis and spread. The essentially 100% mortality rate for rabies is in distinct contrast to mortality rates for most viral diseases. The pathogenesis of rabies is briefly described in Chapter 4, Part I. It should be remembered that since rabies is spread by animal bites, the behavioral changes induced by the virus are important for its spread. Except under the stress of mating or in territorial disputes, vertebrates (especially carnivores, the general host for rabies) do not randomly attack and bite other members of their own species. The high replication of rabies virus in the salivary glands of the rabid host, along with excitability and other induced behavior changes, makes the infected animal a walking "time bomb." This is an excellent example of how a virus of submicroscopic proportions and encoding only a few genes can direct the billions of cells of its host animal to a single purpose: propagation of the virus.